From left to right, Inlander Publisher Ted McGregor moderates the panel with experts Randy Simmons, Hilary Bricken and Matt Cohen. It was a full auditorium at the Bing Crosby Theater last night, with just the faintest scent of marijuana at the doorway. 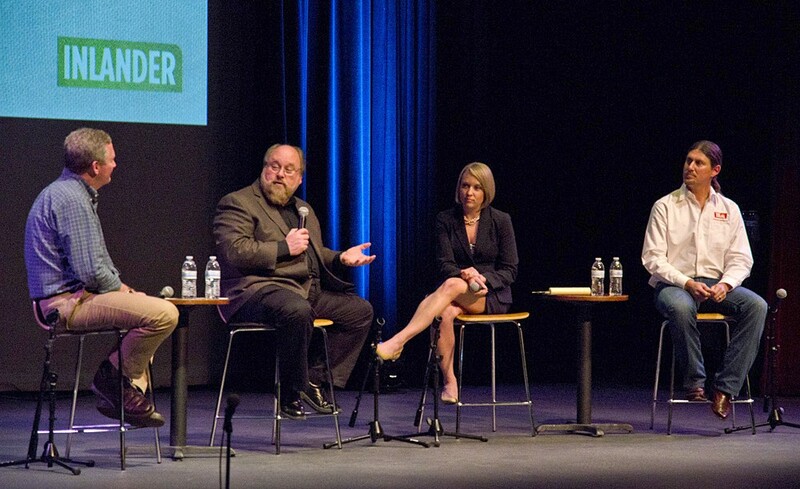 For the CannaBiz Forum, the Inlander invited three experts to speak about Washington’s new recreational marijuana market and the implementation of Initiative 502. The gathering was part agriculture conference, part crash course in civics, with many of the questions coming from business owners or license applicants familiar with the minutia of yields, square footage and local zoning restrictions. Questions about DUI thresholds and whether small operations have a chance against big corporations foreshadow some of the issues we’ll likely see in Olympia, the courts and industry newsletters in the coming years. Many of the unknowns for business owners hinge on how federal and local authorities react and craft policy. (Read our story in this week’s issue about local decisions.) Randy Simmons, who leading the research teams informing the Liquor Control Board, fielded a number of questions about why the market couldn’t be structured in a different way, or have different limits, and he explained that that state Liquor Control Board only has the authority to implement existing state law. Changing that law — to allow for “bud and breakfasts” or a broader range of edibles, for instance — is something to bring up with state legislators to try to get a vote in Olympia. “If you have an idea like a ‘bud and breakfast,’ you’d have to get that type of license approved through the state legislature,” Simmons says. Another example of the liquor board’s limited authority is that they will issue licenses to applicants that meet the state requirements, even if those businesses may never be allowed to open because of local restrictions. Hilary Bricken, an attorney who specializes in marijuana business law, emphasized that this industry is going to require risk-takers. There will be winners and losers. Look at Prohibition, she said: Jim Beam could have gone to prison, but he took that risk and is now a household name. Matt Cohen, a medical marijuana advocate and consultant on I-502 implementation, spoke about how his growing operation was raided by the feds several years ago and was optimistic about Eastern Washington’s potential to integrate the industry in the way wine and craft beer have become important to both agriculture and tourism. “I think you really have an opportunity to brand this region in a de-stigmatized way. … I think there’s a way to brand the industry in a way that’s acceptable to all demographics,” he says. He also answered a question about the black market by saying it’s partly about cost and federal legalization, but it’s also about the quality and reliability of the product. “You don’t buy beer on the street,” he says. Read more about the forum from KXLY. Anyone planning to enter the cannabis market can contact the Inlander for marketing information at cannabiz@inlander.com.